This small improvement is part of our 15 in 15 series. GoSoapBox’s downloadable Excel spreadsheet for Social Q&A contains a list of all current questions, the number of votes, and who asked what. But, the spreadsheet has never included student replies to questions. Replies are not always used, but when they do, they can include some discussion amongst students, as well as Moderator replies. Today, we have added replies to each question. You will see the replies, when they have been added, as additional worksheets in the Excel spreadsheet. 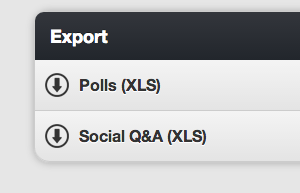 If you are an active user of Social Q&A, give the export button a try and check out the reply worksheets for yourself. This entry was posted in product updates and tagged Q&A on March 23, 2014 by Dave Mulder. Social Q&A was the original feature of GoSoapBox, before we added Polling and our famous Confusion Barometer (Quizzes and Discussions came much later). We love Q&A because it gives students an opportunity to ask questions and vote for questions, creating an awesome feedback loop for academics to always know what’s on the mind of students. Though GoSoapBox Events can be set to be entirely anonymous, most Moderators choose to require names when students join their Events. If you’re going to require names, then we want to make that information available to you. However, Q&A has never included name data for questions, either on the web app, or in our downloadable spreadsheets. Starting today, you will now be able to see a student’s name in two places: directly in the web app, and also in the Excel spreadsheet that you can download via the Moderation Panel. One caveat for this improvement: It only takes effect for new questions in Social Q&A. Older questions will not include the name of the students who added them. And one plug for anyone interested in using Social Q&A outside of an educational context: We also offer Social Q&A as a full-featured standalone product. It’s great for keynote presentations and expert panels, and when we say full-featured, we mean that we have added features and tailored moderation workflow to make Social Q&A the perfect complement for audience Q&A. This entry was posted in product updates and tagged Q&A on March 22, 2014 by Dave Mulder. First on the block of 15 Improvements in 15 Days is something that has been requested by many academics: A way to clear out the results of a Quiz. From the quiz editing page, you will see a new link. “Reset Quiz Results”. Clicking this will bring up a confirmation screen and when you’ve confirmed the reset, all results from the existing Quiz will be wiped away. This means that students will be able to re-take the Quiz. Important Note: Resetting a quiz is a permanent action. Once done, you will not be able to access the previous results. So if you want to save the data, make sure you export it before resetting. This entry was posted in product outages and tagged quizzes on March 21, 2014 by Dave Mulder. As part of our 15 improvements in 15 days series, we’ve added some helpful information for polls. Specifically, we are adding the total number of poll responses, in two places. First, as a moderator, you can see the number of responses to a Poll directly on your Event Dashboard. This updates in real time, so you know, at a glance, how many people have responded. Second, you can see the number of responses to a Poll from the Poll results screen. Like the notification on your Event Dashboard, this number also updates in real-time along with the poll results. This entry was posted in product updates and tagged polling on March 20, 2014 by Dave Mulder. Over the last few months, we have received many great suggestions for improving GoSoapBox. Some of the ideas are small, others are huge, but each and every suggestion is read and considered by our development team. Unfortunately, many of the tiny ideas slip through the cracks. It may take only a few minutes to make a small, useful update, but when we’re working on bigger picture features, those little changes tend to be placed on the back burner. We recently looked at our back burner and realized it is overflowing with these smaller ideas. And we are going to do something about it. Starting on Thursday, March 20, we are going to begin a series of smaller changes while also working on more substantial items. We call it “15 Improvements in 15 Days”. Every day we will knock out a small change and deploy to our cloud application, then detail the improvement here on our blog. If you have any suggestions that would fit the criteria of a simple improvement, please drop us a line at support@gosoapbox.com. This entry was posted in product updates on March 18, 2014 by Dave Mulder.